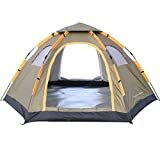 When you're going camping with your family, or with a large group of friends, it might be more cozy for everyone to stay in one tent (even though everyone will have to give up some of their privacy). But a big tent also means taking up a lot of space in the camp grounds, and a lot of effort to set up. 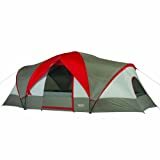 If you plan to be in one place for a long time, like a week or more, you might want to consider a family tent—one that can accommodate 4 people or more. Here is a guide to some of the best family tents on the market. Cabin-style tents: These tents have vertical walls, so that the space inside the tent is maximized. They can also include room dividers to separate between the kids and the parents (or between the kids), as well as an awning at the entrance. Tipis and Bell Tents: These have a cone or bell shape. They are supported by a single, large pole that is placed in the middle of the tent. Surprisingly, these can be made into a 3-bedroom tent! 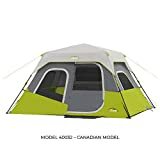 Size and sleeping capacity: Clearly you'll be interested to know how many people you can put up in the tent. The floor space should allow 25 inches ( = 63.5 cm) of width and 90 inches ( = 2.29 m) of length per person. Storage space: A big family means more equipment that you have to take along, as well as personal belongings. That also means you'll need space for all that. 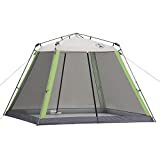 Some tents have a “vestibule”, which is a separate covered area outside the tent for storing your boots, maps and other gear from the elements, without cluttering up the tent's sleeping space. 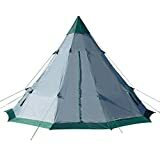 Some can be fitted with a “loft”, which is suspended underneath the roof of the tent. It allows you more storage space in the tent. 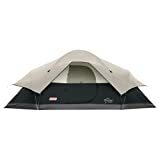 Tents for all ages of children: If you have very young children, you'll want a tent that will allow for kids having an earlier bedtime. But it's also important that it's easy to attend to them if they need something in the middle of the night. So you'll want a separate room for the kids, that's still easy to access. Older children will require more privacy, both for them and for you. So look for the tent that best suits your needs and those of your children. 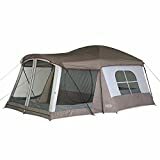 Number of doors and windows: Since a family tent accommodates more than one person, you need more than one door, so it's easier to go in and out. “Doors” on a tent are zipped open and closed—the noise that they make might be a consideration. Roofing: The sun rises early in the summer—and maybe you or your children want to sleep later. Some tents are made from a darker roofing in a section that is designated as “the bedroom”, so that they will keep the sun out. There are also tents equipped with blinds over the window, to allow you privacy. Poles and pole material: Fiberglass poles are light, but not sturdy, and when you have a big tent, sturdiness is a necessity. Aluminum or steel poles are considered a more sturdy choice than fiberglass poles. Accessories: Some tents have a “footprint” or “groundsheet”, which is an extra layer to go underneath the tent floor. It protects you as well as the tent (it is easier to replace the “footprint” than repairing a tear in the tent). 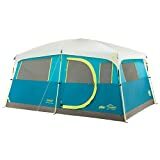 Another option is a “porch”, which is added onto the entrance of the tent. It can keep out rain, if you're unlucky enough to have it rain while you are camping. Also, a “mud valence” is an extra piece of fabric around the bottom of the tent, that keeps rain and mud from splashing onto the tent during heavy rain. Coleman-- is an American company started by W.C. Coleman in 1905 in Brockton, Alabama. He originally started manufacturing gas lamps, but soon expanded to outdoor gas stoves, and then eventually to an entire line of outdoor recreation products: tents, sleeping bags, camping furniture, backpacks, and more. Browning—is a branch of Alps Mountaineering, a company started by Dennis Brune in 1993, based in rural Missouri. Browning is Alps Mountaineering's line of sleeping bags, air pads, tents and camp furniture—like chairs and cots. 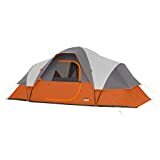 Ozark Trail—Ozark Trail is the name of Walmart's division for tents and camping gear. They are well-known for selling a quality line of tents in a range of sizes, at a relatively low cost. Highlander Outdoor—is a family-owned company based in Edinburgh, Scotland. The founder, Bahram Golzari, started the company in 1985 when a local military surplus store went out of business and he was able to buy the stock. His goal is to make outdoor goods that are as durable as military supplies, but that an average consumer can afford. Their merchandise was chosen to supply the 2012 London Olympics.